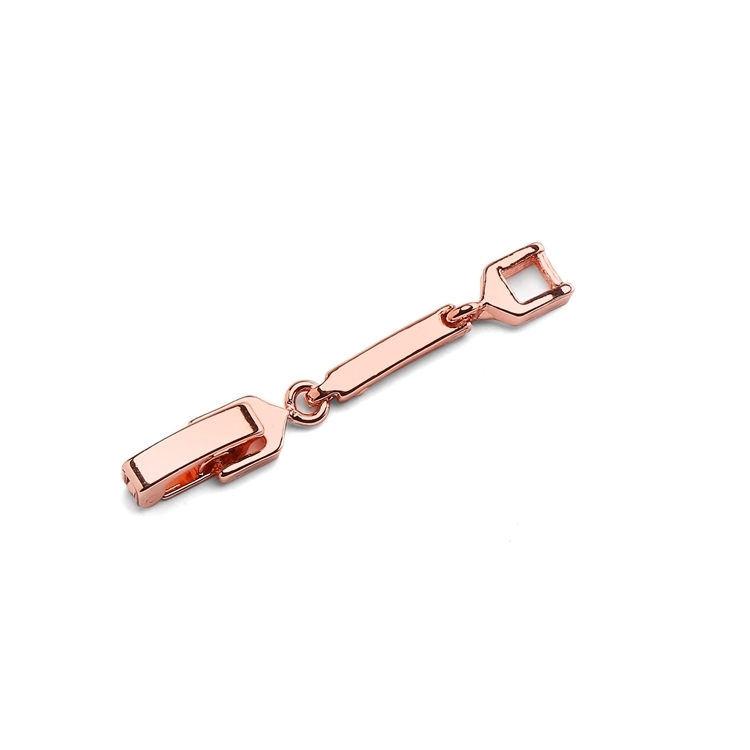 Guarantee a perfect fit with Mariell's Genuine rose gold necklace extender with foldover clasp. Our convenient extension adds 1 1/4" to necks or bracelets. Mariell's delicate one-row rose gold rhinestone coil bracelet is a guaranteed best-seller for brides, bridesmaids, proms and homecomings - and one size fits all. Our classic glass pearl wedding earrings are handmade in the USA with genuine crystal studs. At a low wholesale price, our earrings are a bridal favorite. Mariell's 1/2" round 5 Ct. Cubic Zirconia Pendant has the brilliance of a genuine diamond! 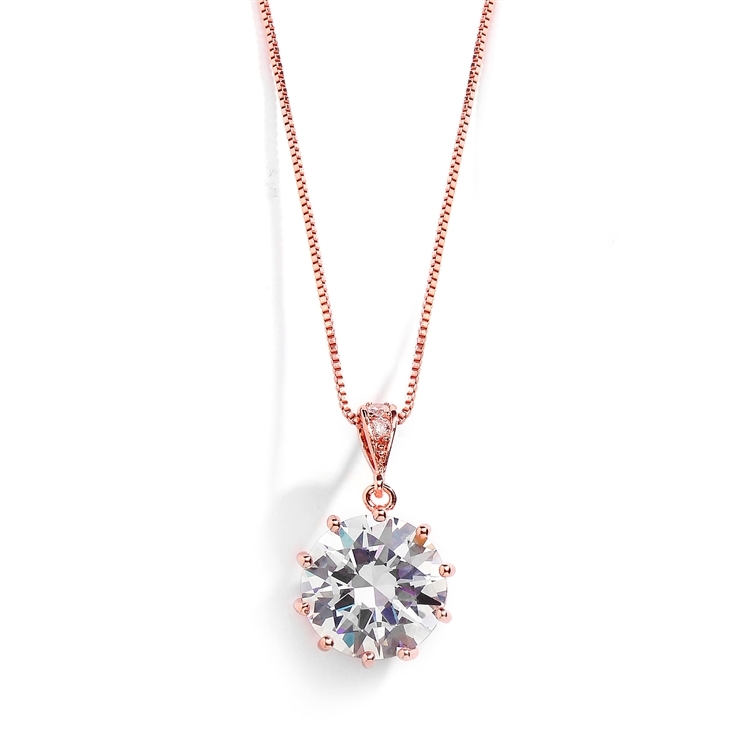 Our CZ is set in 14K Rose Gold plating for the look of fine blush gold jewelry. Brides, bridesmaids, mothers of the brides & prom girls will turn heads in this 16" - 19" adj. necklace. 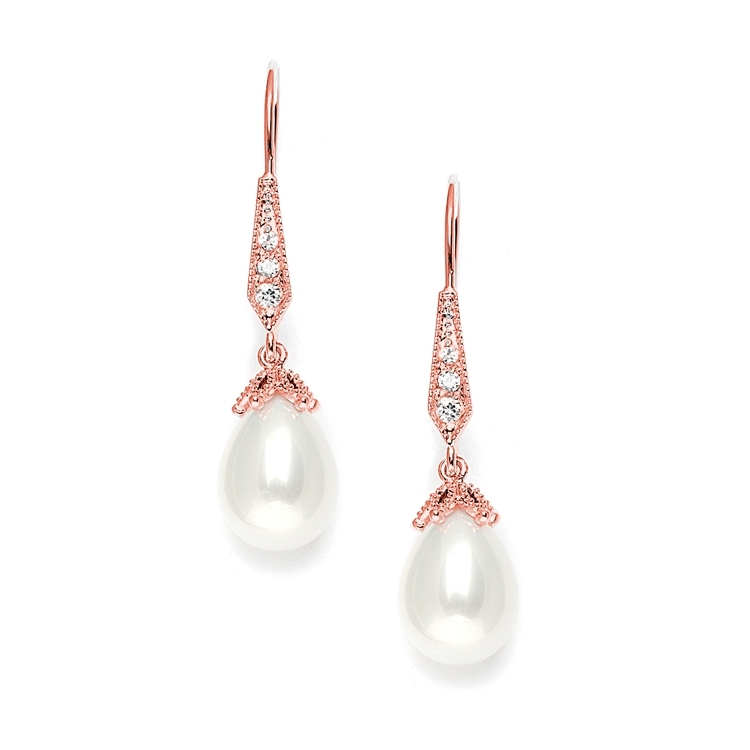 Add endless sparkle to any special occasion with Mariell's gorgeous wholesale earrings with rose gold plated crystal teardrops. Don't miss these stunners, abounding with inlaid gems. Our gleaming pierced bridal or prom earrings are surefire head-turners! 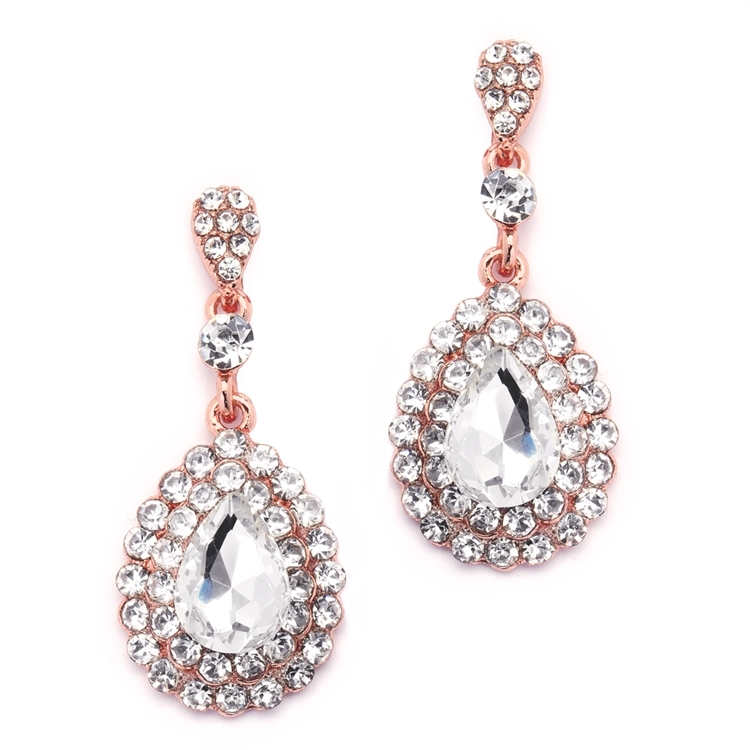 2" h.
Add endless sparkle to any special occasion with Mariell's gorgeous wholesale earrings with rose gold plated crystal teardrops with pink crystals. Don't miss these stunners, abounding with inlaid gems. Our gleaming pierced bridal or prom earrings are surefire head-turners! 2" h.
Our Rose Gold pear shaped pave drop statement earrings are a top-selling choice for prom, bridesmaids & homecoming at a great low wholesale price! 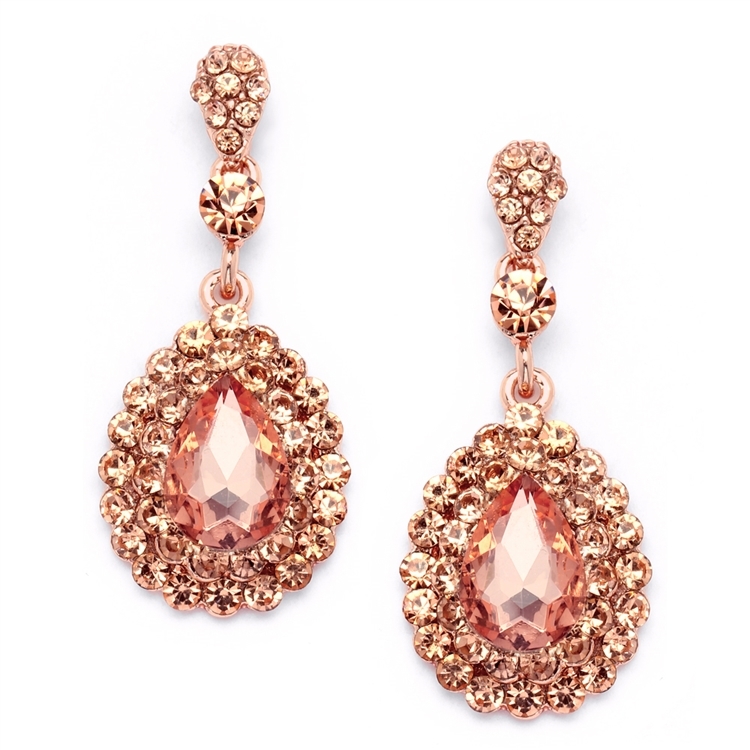 Our Rose Gold pear shaped pave drop statement earrings with peach colored crystals are a top-selling choice for prom, bridesmaids & homecoming at a great low wholesale price! 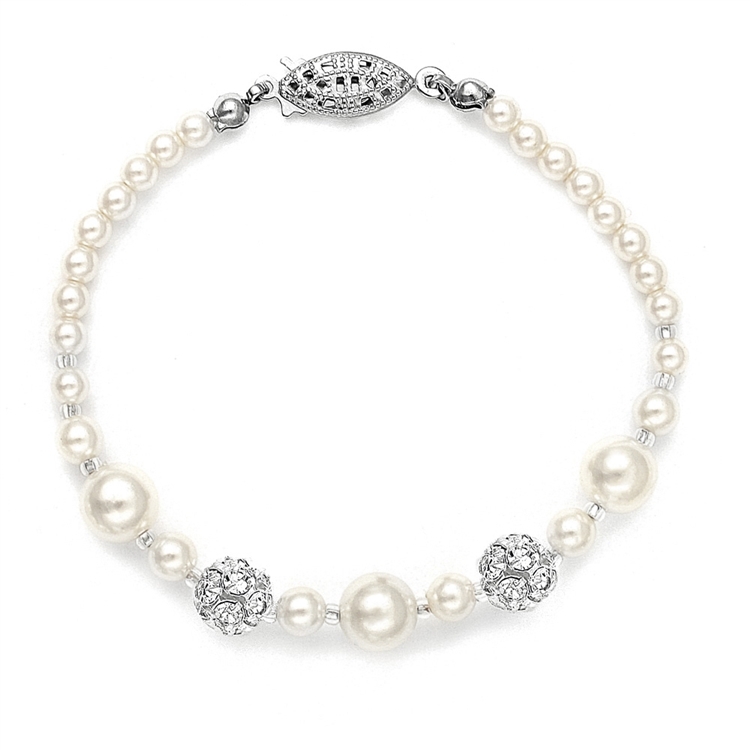 Mariell's popular wholesale wedding bracelet in larger 8" length features a blend of assorted sized pearls highlighted with shimmering Austrian crystal rhinestone fireballs. 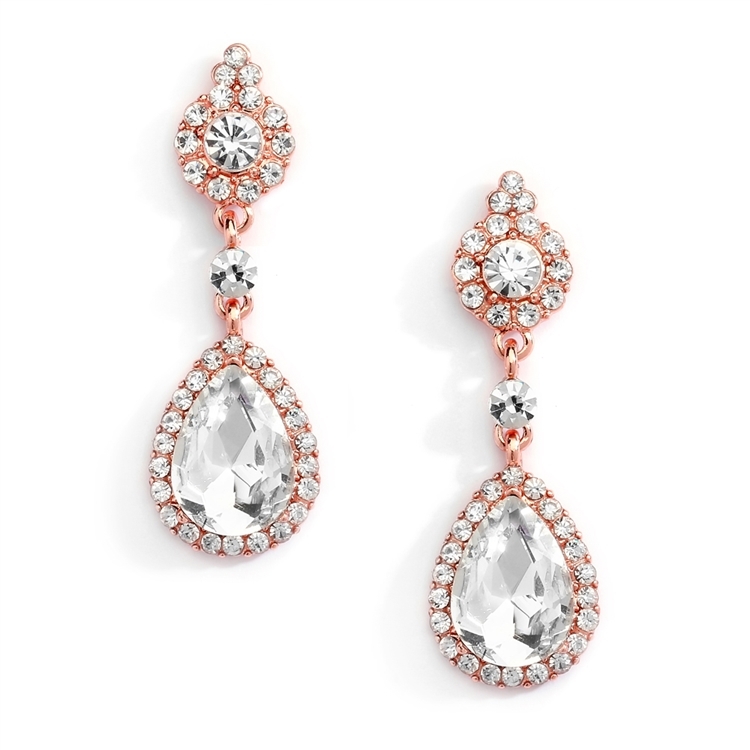 Great style at a great wholesale price, these top-selling bridal or special event Rose Gold teardrop earrings have it all. They feature a bold pear-shaped drop and distinctive braided top, fully framed with inlaid crystals. 1 3/4" h.
This top-selling stretch bracelet with black diamond crystals is the perfect high fashion jewelry for bridesmaids, prom, homecomings or parties. This sparkling bracelet is a great addition to your jewelry showcase at an attractive wholesale price. These dazzling wholesale drop earrings by Mariell feature brilliant marquis cut Cubic Zirconia stones framed with micro pave CZ's giving these elegant earrings the rich look of real diamonds. Enhance your store's wedding or special occasion jewelry display with these breathtaking lever back dangle earrings plated in lustrous Genuine Rhodium at an attractive wholesale price!